My vacation last week was actually pretty exhausting. However, there was a pretty phenomenal occurrence that took place. Yes, I'm speaking about the final stages of complete Phillies indoctrination of my two children. They both got the Phillies bug after they saw Roy Halladay throw the 20th Perfect Game in pro history a few months ago. Then my eight year old went to a game in Philly, and my mom bought him PJ's and Victorino T-Shirts and a couple other things. A week with 14 relatives and rabid fans surrounding them at all times was almost enough. It finally happened when they were given Phillies caps. Not new ones. That would be too easy. They got to choose from a collection of old (yet awesome and cleaned up) hats from their Uncle. I can't even rip the things off long enough to bathe them now, they are 24-7 hats. And I just bought tickets for mid September for when the Phils travel down here to destroy the Marlins! 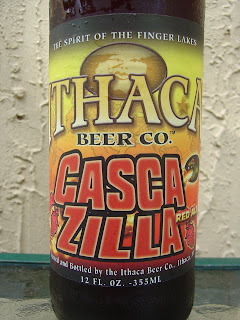 This afternoon I'm drinking Cascazilla Red Ale brewed by Ithaca Beer Company in Ithaca, New York. 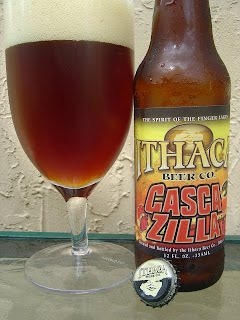 If you are not familiar with Ithaca, you might not understand the name game on this beer. 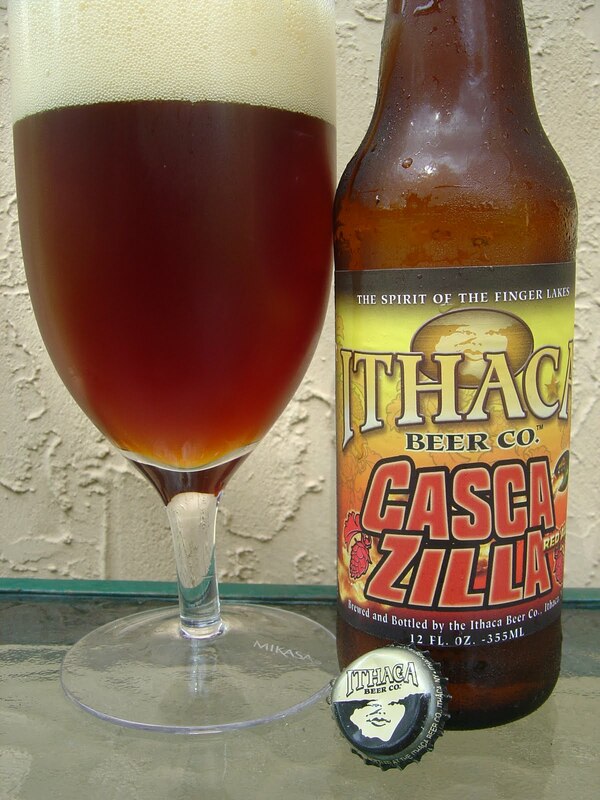 There is a famous gorge (BTW, Ithaca is Gorges) called the Cascadilla Gorge and there are the Cascadilla Waterfalls, and from there everything else Cascadilla, even schools. Playing and swimming in those gorges is a spectacular event if you ever are so inclined. 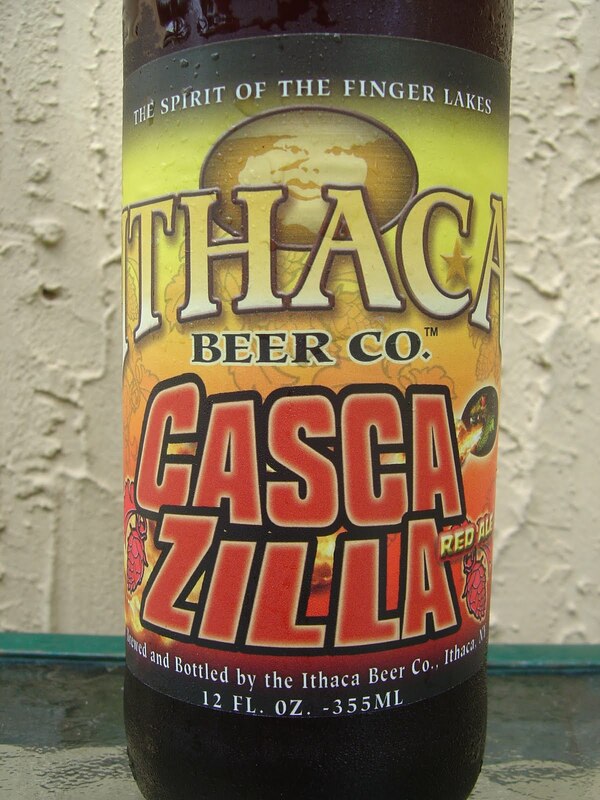 That's probably the only thing I miss about Ithaca, except Wegmans. This brewery did not exist when I went to college there. Best Before August, no year. Well, it's August, so I guess I'm slightly late, even for 2010. Malty caramel and citrusy, hoppy aroma, both present and distinct. Spicy black pepper flavors start things off. They are then subdued, but not knocked out, by some sweet caramel. Tea and lemon citrus and pine hoppiness balance out the sweetness a little. Sweet never surrenders, and actually it eventually wins the battle. Some mercenary spicy grenades do keep digging into your palate, though, so watch out! Wow, I think there are three teams in this beer. Sticky texture, good body, could definitely use a couple more carbonation doses, though. The alcohol is noticeable by the end, drying out the finish considerably. Pretty good beer!